ACM SIGGRAPH stands for Association for Computing Machinery Special Interest Group for GRAPHics and interactive techniques. 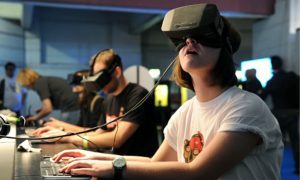 The organization focuses on creative technologies, virtual reality, animation, computer graphics, and immersive environments. This would be the perfect opportunity for creative and artistic students from the College of Fine Arts to meet and connect with individuals from the Computer Science Department to create a healthy and diverse community to promote art and technology. Interest in virtual reality, augmented reality, immersive experiences, digital story-telling techniques, interactive techniques, video games, computer graphics, animation is a plus! This semester, we are holding workshops for beginners to learn how to use Maya (for animation), Arduino, Python (for coding), and many other useful creative tech skills. We are also writing tech proposals to obtain tech such as 360 GoPro Rigs, Oculus Rift Developers Kits, etc. For this meeting we will go over our upcoming events for this semester including guest lectures, workshops, tech demos, etc. We will have Google Cardboards, a Leap Motion, Zoetropes, Oculus DevKit 2, etc. to play with so bring your friends and get involved!